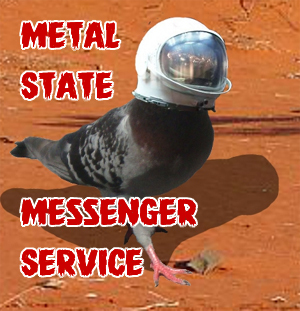 By the way, hyperspace pigeons fly faster that the speed of light, so they arrive there before they leave here. Of those lists, 35 rank albums in order of preference and two are in no particular order. We’re listing the top albums from each of the 35 ranked lists and posting a song from each of the Number 1 albums. We’ll do that in five batches of seven lists each. Have I lost you? Of course not. Metal is more complex than most main types of music. You have to be above average intelligence to play it and/or enjoy it (Mammal’s Book of Everything, 2015). There are a few extremely gratifying points to note from those lists. One, the 35 lists include 33 different Number One albums. Two, the top three on the various lists extend beyond metal and include electro-rock, punk, alt rock, symphonic prog rock and jazz-prog fusion. Three, and by far the most importantly, there are so many brilliant albums in the complete lists that it would take a year for any one person to soak up and digest all of them. Metal is looking healthier than ever. Posted on January 8, 2015, in Best of 2014 and tagged Artists’ Top Albums of 2014: Part 1/5. Bookmark the permalink. 1 Comment.